Freddie Gray’s family and the people of Baltimore were denied justice by Judge Barry G. Williams' refusal to hold Baltimore Police Officers Edward Nero and Caesar Goodson Jr. accountable for Gray’s death. This injustice sends a clear message: Black communities cannot rely on law enforcement to protect their lives or the justice system to protect them from police violence. If police departments and our justice system want to strengthen their relationships with Black communities, it is paramount for them to demonstrate that they can—and will—police their own. 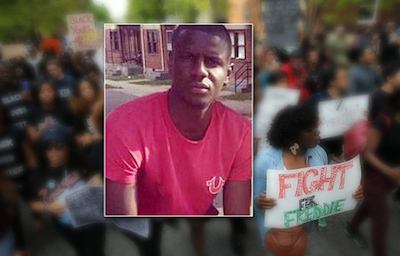 While a guilty verdict for Edward Nero and Caesar Goodson Jr. would not have solved all the challenges facing Black communities in Baltimore, it would have been an important step towards justice for Freddie Gray. There is an epidemic of racial bias, police violence, and a lack of accountability in our country's police forces. Thousands have been killed. Millions more have been sucked into the criminal justice system by racially-biased practices — stripped of their rights. The federal government could, at the direction of President Obama, significantly change these conditions — but it's not happening yet and won't happen unless we raise our voices. Please join us in calling on President Obama to crack down on violent and discriminatory policing by issuing an executive order to direct the DOJ to enforce our civil rights laws more aggressively. Below is the letter we will send on your behalf to President Barack Obama. Freddie Gray’s family and the people of Baltimore were denied justice by Judge Barry G. Williams' refusal to hold Baltimore Police Officers Edward Nero and Caesar Goodson Jr. accountable for Gray’s death. The national crisis of violent and discriminatory policing, and the damage done to communities by a racially-biased criminal justice system, demands your executive action. There are plenty of federal laws on the books that, if enforced, could hold officers and police departments accountable when they discriminate, use excessive force, or kill unjustly. Yet, year after year, we see more injustice, brutality, and death with little or no accountability. You have both the power and responsibility to help end this national civil and human rights crisis. I urge you to use an executive order to enforce and expand federal bans on discriminatory and violent policing, and to strengthen current disciplinary mechanisms for law enforcement nationwide; to direct the Department of Justice and the FBI to investigate and prosecute police misconduct more aggressively.